The Purple Scarf: Beauty: Unperfect Bun Tail Maker! Heya! I made a trip to the dollar store yesterday to pick up a few odds and ends (why is it you always end up spending more money than you anticipated at that store?!) and I came upon this product. 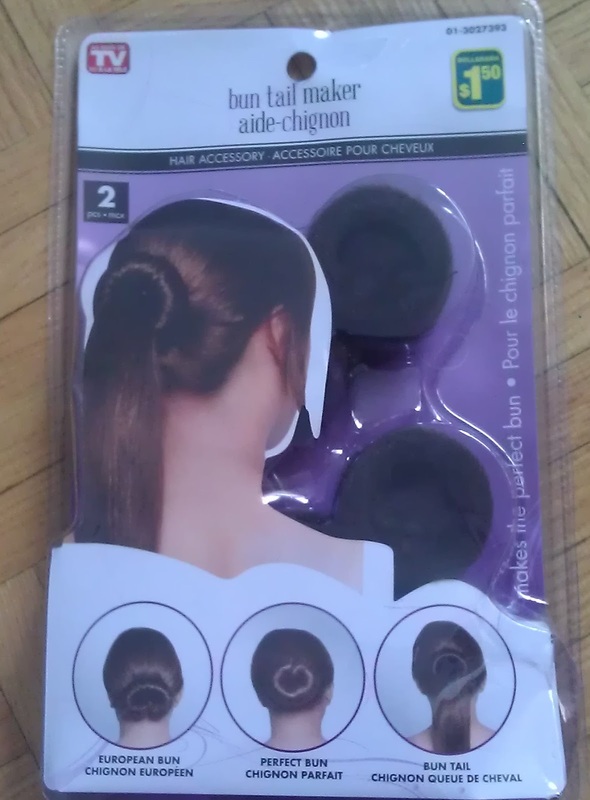 "Makes the perfect bun" the package stated, and since I'm always on the look out for new hair accessories and I was tired of spending too much money on products that don't work, I figured I'd give the perfectly pictured buns on the dollar store package a try. I shouldn't have listened to the buns. First of all the directions do not really make any sense: where is this gap the hair is suppose to go through? After several attempts, I kind of got a semi "bun tail". I can't do the "European bun" or "perfect bun" since I have layered hair. I think if I practice more, I might get a "semi-perfect bun tail" but I do not recommend this product to anyone who has layered hair or hair shorter than your shoulders.